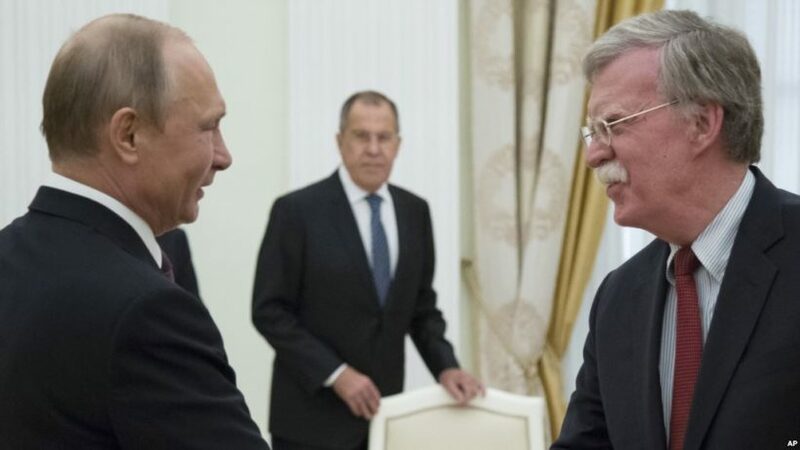 In this June 27, 2018 photo, Russian President Vladimir Putin, left, and U.S. National security adviser John Bolton greet each other as Russian Foreign Minister Sergey Lavrov looks on during their meeting in the Kremlin in Moscow. (by Susan McFarland, UPI) — President Donald Trump on Saturday said the United States will pull out of a decades-long nuclear deal signed between Washington and Moscow during the Cold War. The Intermediate-Range Nuclear Forces Treaty (INF), signed between former President Ronald Reagan and Soviet Union President Mikhail Gorbachevin 1987, bans all land-based cruise missiles with a range between 310 and 3,417 miles. Before a campaign rally in Nevada, Trump told reporters unless Russia quits violating the INF, the United States will terminate the agreement. “We’ll have to develop those weapons. Unless Russia comes to us and China comes to us and they all come to us and they say let’s really get smart and let’s none of us develop those weapons,” Trump said. “But if Russia’s doing it and if China is doing it and were adhering to the agreement, that’s unacceptable. “If others get smart and say let’s not develop these horrible nuclear weapons I would be extremely happy with that. But as long as someone is violating that agreement we’re not going to be the only ones to adhere to it,” Trump said. The New York Times reported on Friday that the Trump administration will tell Russian leaders [this] week about the plan to exit the landmark treaty, partly to enable the United States to counter a Chinese arms buildup in the Pacific. Trump’s national security adviser John Bolton [was] expected to warn Russian President Vladimir Putin [this] week during a trip to Moscow. From United Press International (UPI .com). Reprinted here for educational purposes only. May not be reproduced on other websites without permission from UPI. From an Oct. 20 report. 2. What is the INF? – When was is signed? 3. For what reason will the U.S. pull out of the treaty? 4. What did President Trump say would cause the U.S. to stay in the treaty? 5. What will the U.S. do regarding weapons development if the treaty is cancelled? 6. What will ending the INF with Russia allow the U.S. to do in regards to Chinese aggression? 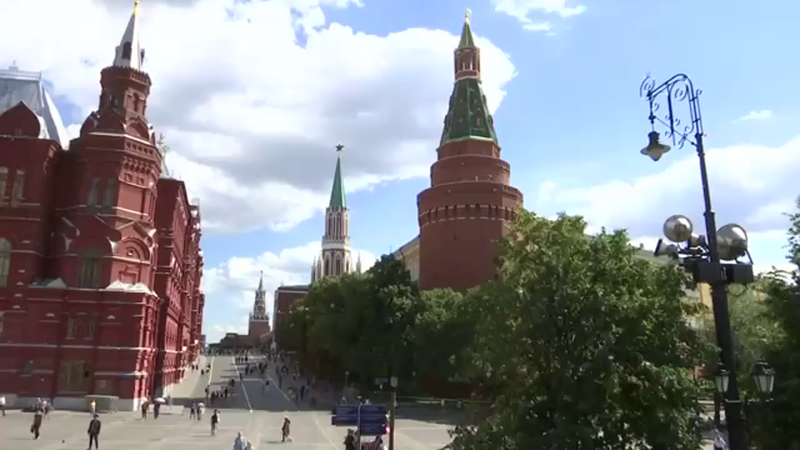 Some observers suggest the Trump administration is trying to get Russia to come into compliance and abide by the treaty. a) Considering the fact that Russia has violated the treaty for many years, do you think President Trump’s threat to cancel the treaty is too strong, too weak or the right thing to do? Explain your answer. The U.S. accused Russia of violating treaty terms with the testing of the SSC-8 cruise missile as early as 2008. The accusation was brought up again in 2014 and 2017. Also in 2013, reports came out that Russia has tested and planned to continue testing two missiles in ways that could violate the terms of the treaty: the SS-25 road mobile intercontinental ballistic missile and the newer RS-26 ICBM. Read a 2017 U.S. State Department report detailing Russia’s continuted violation of the INF Treaty. See the Intermediate-Range Nuclear Forces treaty text at the U.S. State Department website. …In testimony given to the Senate…in April 2017, Admiral Harry Harris observed that Communist China’s People’s Liberation Army’s Rocket Force (PLARF) has developed the largest and most diverse missile force in the world. 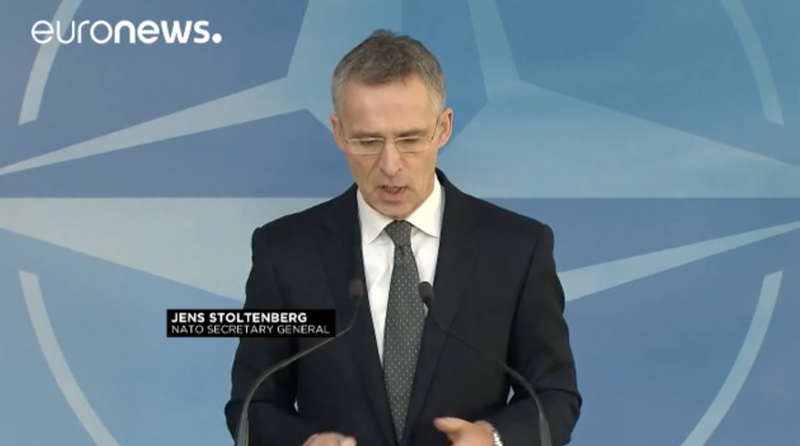 Approximately 95% of the PLARF’s missiles would violate the terms of the INF Treaty if China were a signatory….